After high school, Samuel left his hometown to strike out on his own. Like so many young people his age, he had a hard time making ends meet and jumped from one job to the next, including selling cosmetics, working construction, stocking a store, and running a game business. For some of these jobs, Samuel was required to sleep at his place of work, and found himself spending a lot of time with other young people who got restless when business was slow. After getting into some trouble in the big city, he returned home and took up farming, like his parents. His father saw a test model of KickStart’s solar pump at a demonstration, and thought it could help keep his son busy. When he told his son that he saw a pump that ran without using petroleum, Samuel couldn’t believe it and decided to check it out. 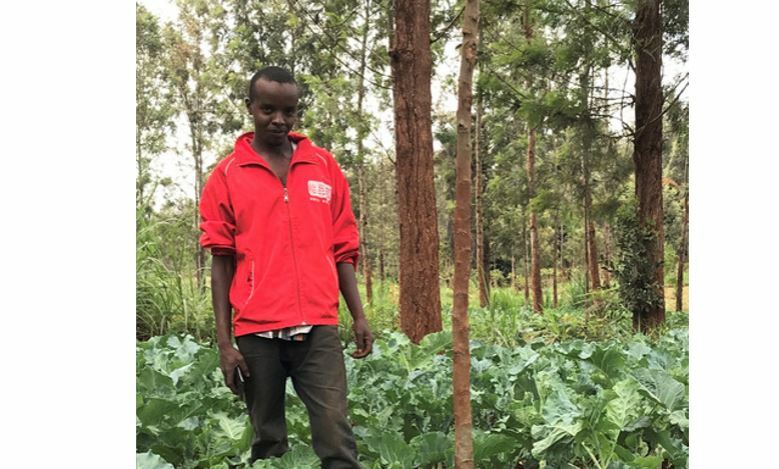 By using the KickStart solar pump test model to irrigate, Samuel became so successful that he took over his parents’ land to produce crops that were both more nutritious and more profitable. Today, he grows kale, spinach, tomatoes, and sweet peppers, and has his own livestock and, in his spare time helps out his parents. Typically, Samuel farms in the morning and the afternoons, and sells his produce in the cooler part of the day. For the rest of the day, he explores opportunities to make even more money and expand his business. With farming, Samuel says that he is now able to plan his future and be his own boss. And that future is bright – he hopes to rent more land and open up a small shop. Your gift of any amount today helps KickStart reach more young entrepreneurs like Samuel.